The anatomical structure of the hand is truly an engineering marvel. It is uniquely structured to provide for the ability to grasp and hold on to things, as well as perform precise movements, such as writing. The ability to grasp and hold on to objects enables the human to use tools and manipulate objects with a degree of precision far beyond the capability of any other animals. What are Some Unique Anatomical Features of the Hand that Enhance our Ability to Grip and Hold Things? Three Arches:One longitudinal arch, runs the length of the entire hand and places the hand in a cupping shape. This naturally facilitates wrapping one’s fingers around an object. The two transverse arches (Proximal and Distal transverse) run perpendicular to the longitudinal arch, and because the metacarpophylangeal (MCP) joints of the little and ring fingers are quite mobile, it enables them to more fully wrap around the bottom of an object. The greater stability of the MCP joints of the middle and index fingers, allows for a firmer grip. This dual capability of mobility and stability among the four different fingers, maximizes the gripping and holding potential of the hand. Opposable Elongated Thumb: Gripping or grasping requires a force-counter force. The carpometacarpal (CMC) joint of the thumb is a joint that can move in all three planes of motion. This combined with the human’s elongated thumb, allows for complete opposition to the other four fingers. A total of five muscles are involved in applying the force and movement to position and flex the thumb for opposition to the fingers. Finger Flexor Pulley System: There are two major muscles originating in the forearm, that each provide a tendon to all four fingers. The unique “pulley” feature occurs when the deeper flexor digitorum profundus muscle tendons emerge and pass through the split tendons of the more superficial flexor digitorum superficialis muscle. The location where the deeper tendons emerge through the split tendons of the more superficial muscle creates a pulley system that increases the mechanical advantage and the resultant force it can produce in flexing the four fingers for gripping and holding objects. Anchored Skin: Unlike the skin on the back of the hand, the skin on the palm is anchored, via tiny ligaments, to the underlying palmar aponeurosis, a tough connective tissue covering most of the palm. Consequently, when holding something heavy the skin on the palm stays put, in place and does not slide downward under the weight of the object being held. If the human grip was backward, the skin on the back of the hand, which is not anchored down, would move about and hinder grip. However, because we don’t grip with the back of our hand, but rather flex our fingers through a good range of motion, we need movement on the back of the hand, and stationary skin. When you collectively consider these unique features that are designed to maximize hand grip strength and finger range of motion, it makes sense that a glove, any glove, would be engineered to retain these essential features while providing the protections for which gloves are intended. Built in Arches: A pair of gloves that has built in arches will accommodate your hand’s natural arch curvatures. This will ensure a stronger grip in flexing the fingers, while allowing the needed range of motion on the back of the hand and fingers. Proper Thumb Casing Length and Mobility: Because thumb opposition to the fingers is essential in gripping, its ability to effectively move and be positioned for opposition while using various tools and grip locations, it’s movement must not be hindered. 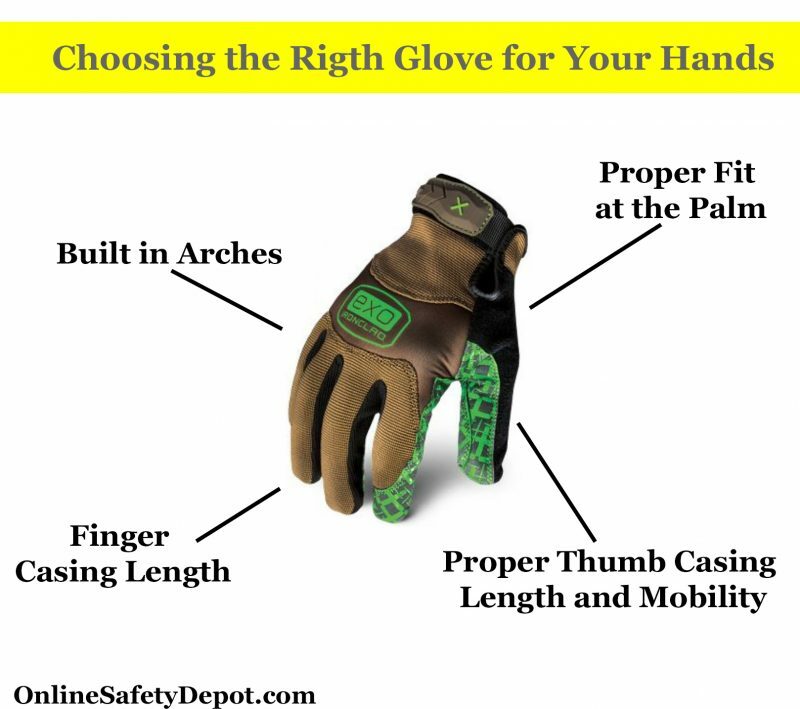 The thumb casing should be long enough to snugly fit the wearers thumb length, and the webbing between the thumb and index finger must allow a proper range of thumb movement while still providing the needed protection to this sensitive part of the hand. Finger Casing Size: The arched formation of the four finger casings should provide for a snug fit to each of the four fingers. Loose fitting gloves allow excessive movement. This will result in a less efficient grip and may even lead to friction burns if excessive and repetitive movement occurs between the fingers and the inner finger casings. Proper Fit at the Palm: Just as a firm and snug fit is important for the fingers, a snug fit in the palm region of the hand is also essential. As this area of the hand receives most of the compressive forces when working with tools, it must also contain the bulk of the padding of the glove.